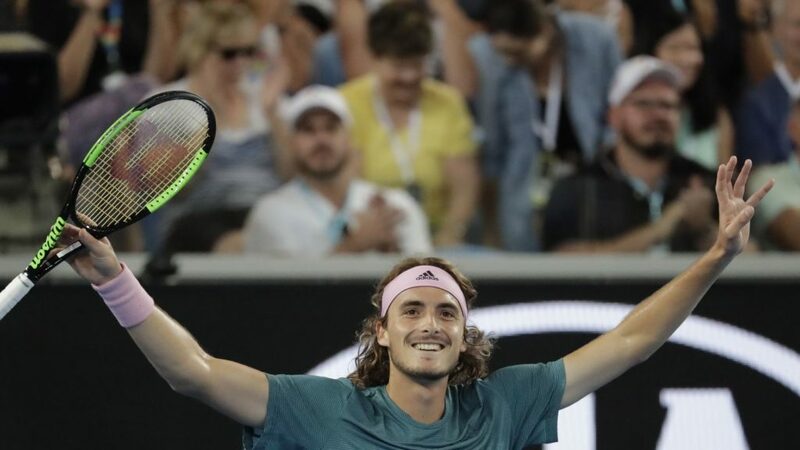 Stefanos Tsitsipas is rising up the ranks of tennis greats and, at the age of 20, he is already sitting pretty at number 12 in the world rankings. His incredible performance against Roger Federer in the Australian Open drew global attention and Tsitsipomania reigned supreme. People couldn’t get enough of him and since then the spotlight hasn’t waned. The good looks of the 6’4″ tennis player has not left the girls indifferent, however the young star has been so focused on his career that he hasn’t had a chance to create a relationship. In an interview with Sport 360, his mother Julia (Yura) Apostoli (nee Salnikova), also a professional tennis star in her heyday, spoke about her son’s private life and indicated that perhaps the time was right for her star to dabble in affairs of the heart. “He has a very nice team, a small team but nice, I think that’s important. Maybe he needs to find his private happiness a little bit, because he’s still single”, said Yura. “It’s good in a way but when you discover something new in your life, and give you a small boost in every sense, you explore yourself as a personality, deeper thoughts, deeper meanings, and you become a wiser person in the process”.